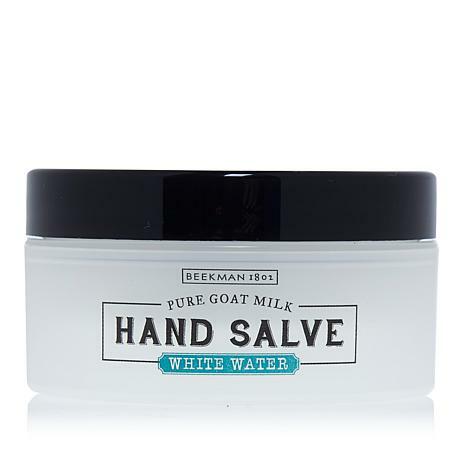 Beekman 1802 Pure Goat Milk Hand and Body Wash Trio 12.5 oz. 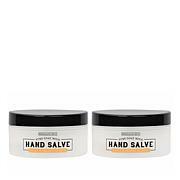 This rich hand salve is perfect for those who have dry skin in need of moisture. Ingredients: Water (Aqua), Elaeis Guineensis (Palm) Oil, Cocos Nucifera (Coconut) Oil, Polyglyceryl-3 Pentaolivate, Helianthus Annuus (Sunflower) Seed Wax, Ethylhexyl Palmitate, Stearyl Alcohol, Honey, Caprae Lac (Goat Milk), Simmondsia Chinensis (Jojoba) Seed Oil, Mentha Spicata (Spearmint) Leaf Oil, Copaifera Officinalis (Copaiba) Oil, Helianthus Annuus (Sunflower) Seed Oil, Rosmarinus Officianalis (Rosemary) Leaf Extract, Ascorbyl Palmitate, Tocopherol (Vitamin E), Butyrospermum Parkii (Shea) Butter, Aloe Barbadensis Leaf Juice, Glycerin, Magnesium Sulfate, Fragrance (Parfum), Phenoxyethanol, Ethylhexylglycerin. Like an overnight Rx for winter weary hands. Although rich, it rubs in without any residual greasiness. White water scent is fresh & clean. A little pricey for one jar. But after this positive experience, will likely watch for future 2 fer offers. This is great! What more can you say. I really liked the Salve. My hands are dry & I have tried a lot of different lotions & they didnt work too good. This worked better to moisten & soften my hands. Love Beekman Boys products. Do not know.Allthe Beekman products I purchased are to be Christmas presents. Beekman 1802 Honeyed Grapefruit Goat Milk Hand Cream 3.4 oz.